In November the entire set of Chase siblings will descend upon Southern California. The last time this happened was in September of 2001 when Mike's brother Mitch got married. There have been several times we've had four of the five siblings and their respective families, but this is the first time that we'll all be together at once! So of course we are going to take a big family portrait. Since the last one, four additional grand kids have been born (our three nieces and Benjamin) so it will be fun in the way that a huge portrait with a large amount of kids is considered "fun"! I'm really thrilled, probably the most excited of anyone. 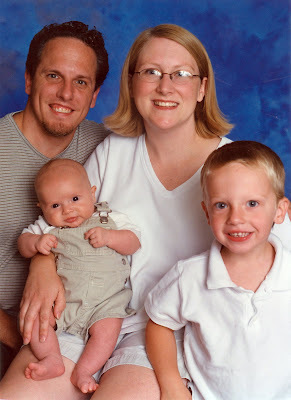 The last time that the four of us had a family portrait taken was right after Benjamin's birth. It was a free sitting where they brought the studio right into our living room and set it up. The photo is perfect... meaning everyone is looking at the camera and appears happy. We never went for another portrait because I felt like we'd never top that one! I think the glare on my glasses masks the tiredness I felt at having a two year old and a five week old. We've taken some snapshots that turned out quite nicely, and we've had a couple taken of the boys together, but nothing with all four of us. 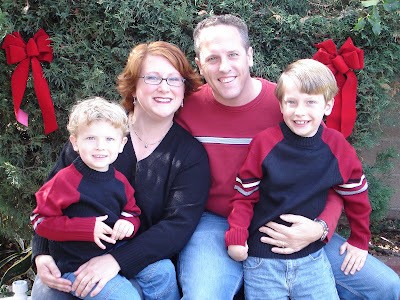 This is my favorite snapshot from our Christmas card in 2006. We set up the tripod and the auto-timer and then ran to pose, fighting giggles.